Some weeks back I discussed Google My Maps as a tool integrated with Google Apps (used by many districts) that can be used to target spatial concepts, description, and narrative while working with curriculum contexts. Recently, Google ported its excellent, but logistically complicated Google Earth program into its web browser, Google Chrome. So now you can use a vastly simplified (for the better) version of Google Earth right in your web browser. I refer to this for laptops and chromebook users, though the iPad version of Google Earth offers you a lot too. I've written about Google Earth a lot, and you may get some lesson ideas here and here and here, knowing that all of those suggestions will be easier in the Chrome version. On Chrome on a laptop or chromebook, all you need to do is navigate to Google Earth at earth.google.com. There you will have an interactive globe at your fingertips, to search or navigate via your mouse. Hit the ? key (you can do this across all Google tools) to see the keystrokes for navigating. I needed to do a little searching to discover that to tilt the view, you hold the shift key while clicking and dragging on your trackpad. Compared to using flat maps or Google Maps, Earth gives you a more "experiential" view of any place, with 3D buildings and geographic structures, as well as flying effects. For your students with Google accounts (and yourself), you can sign in and save "placemarks"- which can be a good way for you to plan an activity. -Use the Voyager feature in the left sidebar to go to pre-made tours with short videos with information. -Use the "I'm Feeling Lucky" feature (the dice icon) in the left sidebar to "fly" to a random location on Earth and have students identify where it is using their knowledge of social studies vocabulary (hemisphere, continent, etc). -Plan a "virtual field trip" to a location related to what students are studying and complete a graphic organizer describing that setting, or other post-activity. I recently discovered that by searching "USA" in the wonderful Epic Books for Kids app (free with educator account), you can access terrific visual books on all 50 States (Exploring the States is the name of the series); you can use these as a guide or structure for searches in Google Earth. 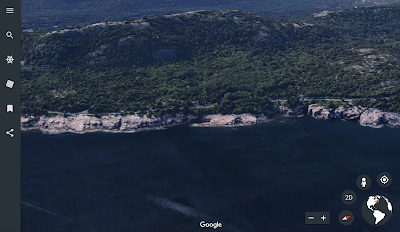 Check out the always-excellent Richard Byrne's video guide to the new Google Earth here.